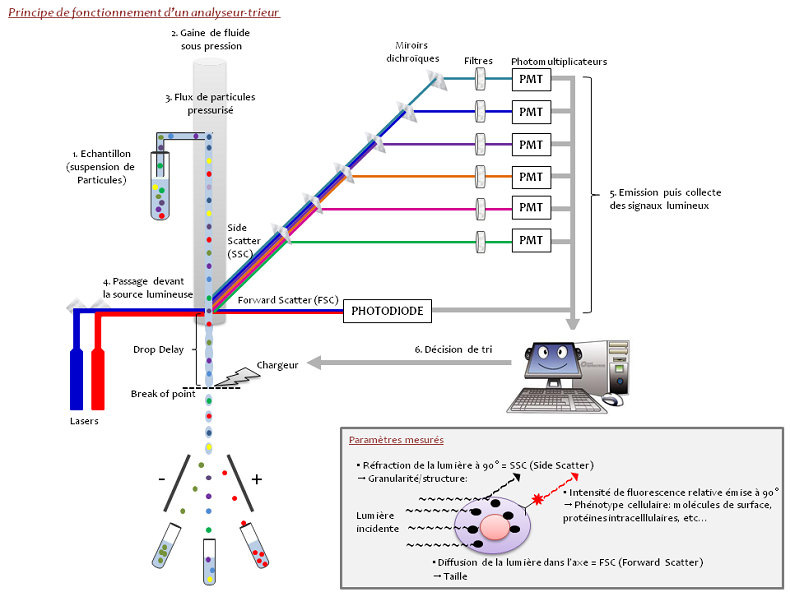 Flow cytometry is a technique that measures particles in suspension (cells, bacteria, parasites, bits), the individual characteristics of each particle such as size, shape, and complexity, irrespective of the component or function is detected by fluorescence. Light diffused at 90 degrees (Side Scatter – SSC) records shape, internal structure, and particle granularity. Fluorescence emitted by an antibody coupled with a fluorochrome and that specifically binds with the cell. The information gathered is presented in the form of graphs or histograms to which statistics concerning the cell populations and the parameters studied (%, CV, fluorescence intensity, etc.) are added. The main advantage of flow cytometry is the speed of data acquisition for a very large number of cells so that complex and/or rare cell sub-populations can be analysed and to sort them ready to be placed in culture or analyse them using molecular biology tools. The sorting may be defined as the physical separation of the cells or particles of interest starting with a heterogeneous population. The cells or particles are aspirated from the sample and injected one by one by a pipe in continuous flow of tampon (PBS type). In applying a wave of vibration to the jet at a determined frequency and amplitude, it is going to break and provide drops at a specific point characterised by its position and appearance time called “break of point”. When the laser beam intercepts the cell, the deviated light and the fluorescence emitted generates a signal that is processed by the sorting programme in order to decide whether or not the cell must be isolated according to the criteria defined by the user. The distance between the laser’s point of impact with the cell and the “break of point” is called the “drop delay”. If one cell of interest before being sorted has been detached, the cytometry waits until it arrives at the “break of point” to charge the drop. As this contains the cell to be sorted, when passing between the strongly charged detection plates, it is deviated to the side with the plate of the opposite polarity and collected. The sorting method may be modified by choosing a maximum of purity or a maximum performance (for a small and precise population) or a maximum precision in the counting for cloning.